Mrs. Maxine Marie Hooper, age 92, passed away Monday, July 2, 2018. She was born in Muskegon, Michigan on May 6, 1926 to Louis & Cora (VanderVoort) Schuitema and married James Hooper on June 30, 1951. Mrs. Hooper helped run the family business and later had been employed as a bookkeeper for Di's Hallmark for over 20 years. 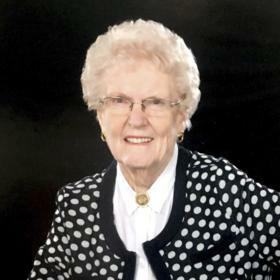 Maxine was a member of Prince of Peace Catholic Church, the Easter Seal Society & the Service League along with numerous other civic activities. She enjoyed gardening as well as volunteering at the North Muskegon library. Husband of 67 years, James Hooper; children, J. Stephen (Leslee) Hooper, Mary Krueger; Mark (Kari) Hooper, Robert (Ginger) Hooper; 10 grandchildren; numerous great grandchildren; sister-in-law, Angie Schuitema; many nieces, nephews & cousins. She was preceded in death by her parents; son-in-law, Robert Krueger; brother, Jack Schuitema. Friday, July 6, 2018, 4:00 pm to 6:00 pm and to at Clock Funeral Home - Muskegon with private family services held at a later date. MEMORIAL: Muskegon Community Foundation - Marie VanderVoort Scholarship. Please visit www.clockfuneralhome.com to leave a memory or sign the online guest book.